Here's the brand new, hot off the press Christmas Skinnies that are a must have for any Skinnies lover. 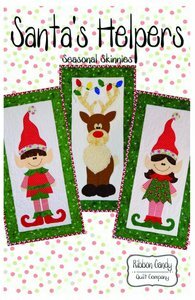 All new Santa's Helpers are a hit for sure in bringing a smile to your face. Each quilt finishes 14" x 28", the perfect size to fit anywre. The templates are full size and ready to go. Fusible web applique is used. Warning: Skinnies are very addicting, you won't stop at just one! These are quick, easy and fast projects for quilters of all levels. They make great gifts too.